Josh holds a nice Muskegon river steelhead, which despite it’s size, put up quite the battle as it ran up around the boat trying to get it into the net ! 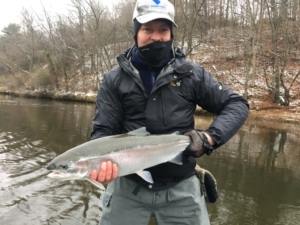 The Muskegon river fishing report for November 26, 2018 in the Newaygo, Michigan area is about both our continued fall/early winter steelhead fishing and the early arrival of “winter” here in west Michigan. Due to several factors, such as limited rains over the last near 2 months, the arrival of December like weather a few weeks early and the lack of big “pushes” of steelhead out of lake Michigan and into the Muskegon river, the steelhead season up to the point has been fair at best over the last few weeks. That being said, we’ve found steelhead fresh out of lake Michigan on many outings dating back to early November, but not in any numbers and covering a lot of water to find them. With both fly fishing and light spin tackle, we’re now focusing on more winter like water to find steelhead, as dropping water temperatures find them in very specific types of water. The short lived warm up of this past weekend did provide some snow melt and runoff, which brought river levels up slightly, but we could really use a 3-4 day run of 45+ degree weather to melt the rest of the now in the upper portions of the watershed and bring more steelhead in from lake Michigan. Our present weather of wet, heavy snow that looks to be sticking around for another day or so, won’t really help our cause, but maybe the warmer weather forecasted for end of this week and coming weekend, will help. Click HERE for current weather information. Present water temperature is in the 40 degree range. Click HERE for current water flow data.